Good quality coffee beans are essential for making any type of coffee. It plays a great role in your espresso tasting good or not. So a rule of thumb here is that always ensure your coffee beans are of good quality. But how can you do this? Try the coffee beans and see which one could make the best espresso coffee before you buy them. Take a good amount of time to research and learn the process of brewing espresso at the comfort of your home. Before buying coffee beans you need to understand that what goes into the mechanism of extracting coffee beans and how they intact the flavour in it. Good quality coffee beans consists of about 12% of essential oils that helps in retaining the flavour in them and this also gives a good amount of heat and pressure when you brew them. You require a temperature between 198 to 201 degrees with 131 pounds of pressure to help lock the flavour in the beans. Never compromise on the quality of an espresso machine when you plan to get one for your home to relish on lip-smacking espresso coffee whenever you want. Just like coffee is grounded, espresso also needs to be grounded. Grinding them well helps to produce excellent flavour, which is why a lot of coffee drinkers prefer espresso because of its strong flavour. A lot of people do not prefer brewing espresso at home because the process of grinding them becomes difficult. If you want your espresso to have the same level of grind, it is advisable to buy them from a roaster who will ensure that you get the right kind of grind, and then you can brew it at home. What makes espresso exceptional is its crema. Crema is always there in espresso and it is nothing but the extract of the natural oils and solids that is dissolved in the espresso mix. They make up the foam in your espresso and can be found on the top as a layer in the espresso. However, the thickness of the crema will depend on the blend, temperature and pressure while brewing the espresso. It usually takes up one-third of the shot glass and it is up to you if you want to drink it leave it as residue. Never compromise on the flavour as that is what makes espresso different from other types of coffee. The flavour plays an important role in how strong your espresso tastes after brewing. For example, if you plan to make vanilla latte then ensure that you get a good quality vanilla syrup that gives the right kind of flavour to the mix. 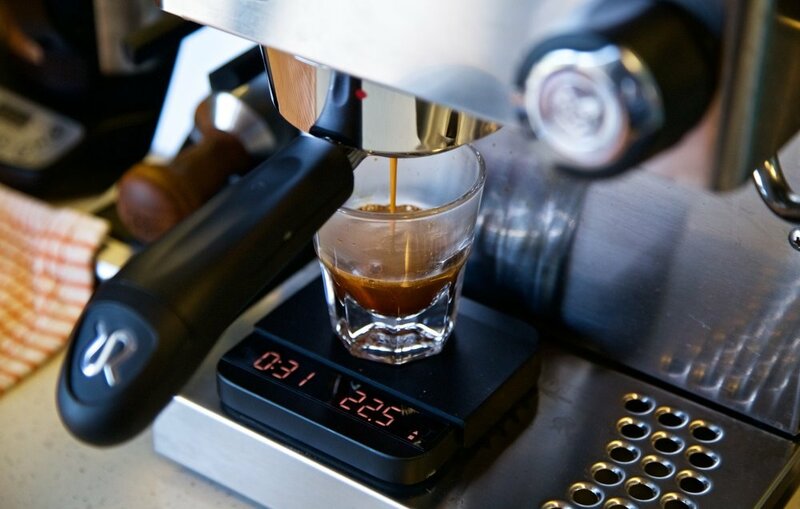 Also, make sure that the concentration level is kept at check so that it complements the strong taste of an espresso. If you don’t already know, espresso is coffee. It is not a brand of coffee nor is it a certain type. Espresso is one of the many ways of preparing coffee. If you are not aware of the preparation method, now you do know what are the basics of preparing a good shot of espresso coffee at home.